First Nations and Metis leaders in Northern Ontario are calling on Lakehead University to address its systemic racism issue. 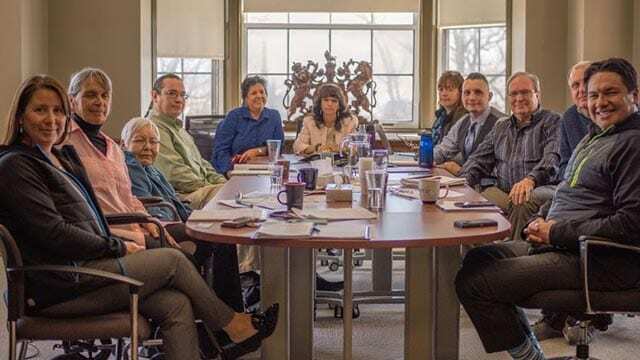 The leaders held a news conference in Fort William First Nation where Chief Peter Collins said they are frustrated and disappointed over the recent resignation of dean Angelique EagleWoman from Lakehead University’s law school in Thunder Bay. EagleWoman announced her resignation from the Bora Laskin law school last month. Now Indigenous leaders want to make sure another Indigenous legal scholar takes her place. “I’m very disheartened that we’ve lost a very strong, First Nations woman leaving the organization here today,” said Collins. “And we will be very vocal to the Board of Governors in addressing this issue going forward,” he said. In a letter to the Aboriginal Advisory Committee in March, EagleWoman said she had been the victim of systemic discrimination because she’s Indigenous and a woman. “From the very beginning of my tenure as Dean, I felt that there were certain staff and faculty members who were very resistant and over time I began to see it as systemic racism and called for cultural competency training within the faculty of law,” EagleWoman told media at the press conference. “And then I begin to experience from the senior administration that they didn’t see it the same way and they weren’t going to support me in those efforts,” she continued. EagleWoman was appointed Dean in 2016. The Bora Laskin law school opened its doors in 2013. Her appointment was significant and promising. 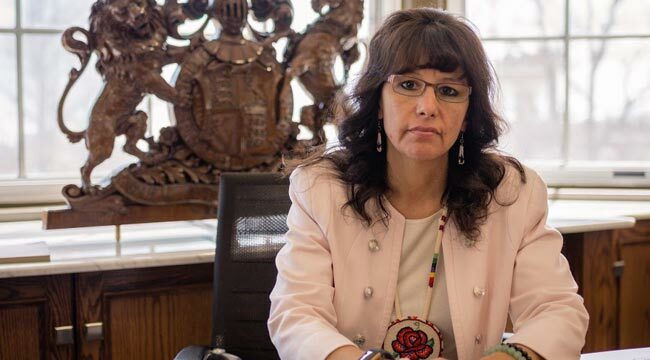 “The appointment of Dean EagleWoman as the first Indigenous dean of a Canadian law school was viewed as a sign of a positive change on the path of reconciliation,” said Tim Pile from the Metis Nation of Ontario. “A change that would benefit the university, Indigenous communities, the law school faculty and programming and especially the Indigenous and non-Indigenous students attending Lakehead University,” Pile said at the press conference. EagleWoman said she tried to implement the school’s Indigenous mandate through initiatives like working with First Nations students from Dennis Franklin Cromarty High School and hosting a conference on Indigenous law and justice. “Thunder Bay is a hub for Indigenous people who want to come and get their education. We have youth coming from remote communities to get high school education, we have people coming to Confederation College, to the university and now to law school,” EagleWoman told APTN. She said staff and faculty were less than supportive of her efforts to do this. “In doing those types of things I was criticized as only focusing on the Indigenous law mandate and again the idea that this was an add-on and not a central part of the fabric of the law school,” she said on Tuesday. Deputy Grand Chief Derek Fox from Nishnawbe Aski Nation said at the press conference that the Indigenous mandate and its Indigenous partners are the reason Lakehead’s law school and medical school exists in the first place. “They use that mandate to get these law schools, they use that mandate to create these two schools on the basis of First Nations beliefs. It seems to me once these schools are created they want to get rid of those teachings,” Fox said. The Northern Ontario School of Medicine opened its doors at Lakehead University in 2005. In a list of recommendations to the university, Fort William First Nation wants a commitment that an Indigenous Dean will be appointed to replace EagleWoman. They also want all the mandatory Indigenous courses to be taught by Indigenous law scholars. “It’s within our traditional territory and the lands of which the university has been built on. These are our homelands, these are our traditional territories and we are responsible for what happens in our area and territory,” Collins said. They are also asking for an independent review into the issues and allegations put forth by EagleWoman. While EagleWoman wouldn’t go into detail about what specifically the issues and allegations are, she told APTN in an earlier interview that she faced aggressive behaviour which led to a hostile environment at the law school. “I also requested cultural competency training several times and again it was denied,” EagleWoman said. APTN earlier reported EagleWoman also faced a human rights complaint filed against her by a former employee for alleged reverse discrimination. “Discrimination in terms of human rights and racism and gender is based on underrepresented people. So in terms of what I experienced, I would say I was the person that experienced the discrimination,” EagleWoman said about the allegation. “I felt like a non-Indigenous person in that role would absolutely have been supported in a way that I was not,” she said about the university’s response to the allegation and complaint. Her name has since been removed from that complaint. Celina Reitberger, a retired First Nations lawyer and member of the Aboriginal Advisory Committee, said they are committed to the ensuring the law school succeeds following EagleWoman’s departure. “We are going to be steadfast in our commitment to find someone to replace her who will make sure the pillars of the law school, especially the Indigenous legal practices are maintained,” Reitberger said at the news conference. Aboriginal Advisory Committee at Lakehead University. Eaglewoman said it’s time for law schools to empower First Nations who want to right the historic wrongs they’ve faced in Canada. “Even becoming a lawyer under the Indian Act meant losing status,” EagleWoman said. Collins said this won’t happen without a unified front from Lakehead University moving forward. “When the university talks about working to deal with truth and reconciliation, they had an opportunity to deal with it in-house and I think they missed the boat on this one,” he said. In an email on Tuesday, Lakehead University said they are reflecting on what’s been shared by Indigenous leadership and they look forward to ongoing dialogue and action. EagleWoman said the university is capable of positive change. “Get out of denial and start looking at how to make the university the kind of environment that’s necessary to allow Indigenous people to gain the education they need to make the societal changes that are necessary,” she said. 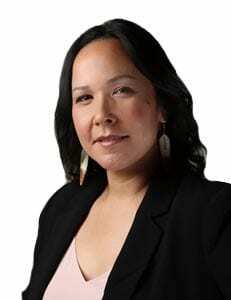 “An Indigenous woman who could come in and carry forward the promise and potential of the law school would be a wonderful next step,” she said. Indigenous students who attended Lakehead University since the early 90’s should be interviewed about the racism and hardships they faced as students. There were the ones that did the hunger strike, there were students that supported Dennis McPherson and there were students that tried to bring light to the issue themselves.